How much Maine home insurance is enough? 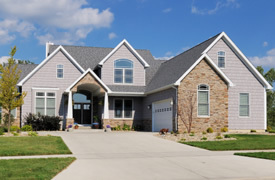 North Atlantic Insurance understands the Maine home insurance needs of our customers. We’ll work with you to estimate the replacement cost for your home and to adjust your policy limits from time to time as needed. Once a review of your home and possessions indicates you are properly insured, it’s a good idea to reexamine your coverages and limits from time to time, especially whenever you make additions or improvements. North Atlantic Insurance can help you re-evaluate your Maine home insurance needs. Just call and speak with one of our agents. Call North Atlantic Insurance - If you have questions or concerns about the limits in your policy, ask us to show you how those amounts were calculated. This will also give you an opportunity to make us aware of any overlooked information. If you have an art collection, antique furniture, jewelry, or other valuable possessions, ask North Atlantic Insurance about supplemental coverages, such as fine arts or scheduled property endorsements, to adequately protect your investment in these items. The cost is modest for the extra protection, and often the deductible is waived. Keep in mind that Maine requires certain minimum levels of coverage. The right coverage for you is unique – talk to North Atlantic Insurance today to find out how to get the best price and value on home insurance for you.